Award-winning author Karen Janowsky adds a fresh, new take on the superhero craze with her new series, “The Persistence of Memory.” The first book, The Persistence of Memory: Déjà Vu ($14.49, paperback, 9781545662120; $2.99, e-book, 9781545662137), utilizes a mixture of genres to explore the meaning of life and love. 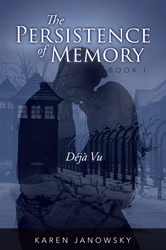 Daniel and Nina do not remember one another, but their involvement in previous lives has made them targets of evil forces now determined to erase human history. Even superpowers will not be enough unless they can remember and reclaim their love. “[The series] explores the intricacies of human relationships as it delivers the goods for those readers who enjoy urban fantasy, adventure, and steamy romance,” said Janowsky. Karen Janowsky teaches both writing at yoga at the College of Southern Maryland. She earned a Master’s degree in English from Florida State University and the Anabiosis Press Chapbook Contest in 1994 for her book The Girl Who Ate Blue. Mill City Press is a division of Salem Media Group, with almost 12,000 titles published to date. The Persistence of Memory: Déjà Vu is available online through millcitypress.net, amazon.com, and barnesandnoble.com.